The Sheriff of Babylon is far more than the sum of its parts. It would be easy to label it as a crime story set in post-9/11 Middle East — and you wouldn’t be wrong, because at a fundamental level, that’s what it is: a whodunit set in unfamiliar terrain — but its pointed political subtext, and its creators’ willingness to explore wider issues, makes The Sheriff of Babylon a far more provocative tale. In post-Saddam Baghdad, Iraq’s capital city has been devastated, and is without a police force to keep its citizens safe. Former Florida police officer Chris Henry is now a US military consultant, and has been assigned to train the city’s future law enforcement personnel. But when one of his trainees is found dead, Henry is forced to take the mantle of investigator, and partners with Nassir — a former Baghdad detective — to unravel the mystery. Naturally it’s not quite as cut-and-dry as that. Nassir has his own secrets; the dead American soldiers in his basement is merely the exclamation on his troubles — and Henry’s sometime lover, Sofia — an American-born Iraqi — is convening with disparate factions to seize control over her country. The Sheriff of Babylon is appropriately gritty and layered with authenticity thanks to writer Tom King’s experience in the CIA. Together with artist Mitch Gerads, they perfectly encapsulate the sense of a city, and entire nation, perched on the abyss. Everyone – from the civilians to the military personnel – are paranoid, and cognizant that they are a hair trigger’s moment from complete capitulation and anarchy. Chris Henry is a fabulous protagonist – as determined to uncover the truth as he is reluctant to shake too many trees – and King’s aversion to cluttered caption boxes means readers get to know the character exclusively through his dialogue and actions. It’s nice to not have his every thought and inclination spelled out – nuance is increasingly rare in comics, and it’s even rarer for creators to not baby their readers with voluminous explication. King and Gerads have created an important work that conveys the culture clashes and inner-workings of post-Saddam Iraq. But just as it highlights the cultural differences, it underlines the kinship that unites all humans, regardless of race, ethnicity, or place of birth. Nothing is black and white in this world, and The Sheriff of Babylon is not afraid to expose the grays. This first volume concludes with plot threads left dangling, and like any great season finale, ends with a deserving (and devastating) cliffhanger that’ll leave readers emotionally drained, and desperate for the next installment. I’d say this is as good as comics get, but I wouldn’t put it past this creative team to one-up themselves in the next volume . . . which can’t come soon enough, as far as I’m concerned. Besides her most recent incarnation in Skyfall, the Miss Moneypenny who has existed in more than 60 years of James Bond continuity has been entirely deskbound; a pining secretary, who absorbed 007’s innuendo and traded witticisms with the licensed-to-kill agent. For the most part, the character has been entirely disposable, save for the occasional stinging rejoinder at Bond’s expense; moments to saviour, for they were few and far between. But what if there was more to Moneypenny than the insipid qualities she routinely brandished? Skyfall opened the door to an alternative take on the secretary, and we’ll see where that goes in the franchise’s next installment – but Ed Brunaker and Steve Epting latch onto that notion and run with it full throttle. The result, this first volume of their monthly comic series Velvet, titled BEFORE THE LIVING END, is a fantastic spy-thriller, with shades of Ian Fleming’s inimitable protagonist, but stands comfortably apart on its own pedestal. The creative partnership of Brubaker and Epting resonates in comics. Together, the writer and artist redefined Captain America, and their long run on the title has become definitive; for the foreseeable future, every creator’s take on the shield-wielding patriot will be paralleled to theirs. 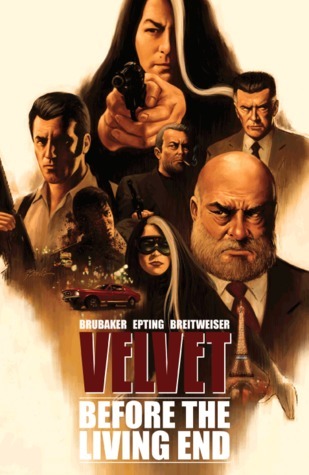 But VELVET allows Brubaker and Epting to break from the confines of corporate characters – there’s no holding back. Storytelling choices, both artistic and regarding script, are executed in magnificent tandem. The plot unravels with the deftness of a John le Carré novel, but punctuated with the adrenaline-fueled bursts of a Robert Ludlum or Matthew Reilly thriller, while Brubaker keeps the dialog succinct, his trademark noir vibe permeating the necessary exposition. Epting’s artwork has never looked better, his layouts carefully considered, allowing for a seamless reading experience. Character interactions are embellished with incredibly detail; emotions play across their faces with unparalleled finesse. And the action is choreographed to perfection, whether it’s hand-to-hand combat or a 007-esque car chase scene, you won’t find better execution elsewhere in comics. BEFORE THE LIVING END throws all the elements of a successful spy story into the mix, but it never feels overtly derivative, beyond the connotations Brubaker and Epting purposefully highlight. Set in 1973 (but with plenty of flashbacks) Velvet Templeton is an ex field agent (or “X-Operative”) turned personal assistant to the Director of the clandestine agency ARC-7. When one of the agency’s top X-Operative is killed in Paris, Velvet sits in on the debrief, and decides to personally investigate the murder – which ends up seeing her marked as the killer and a traitor. Velvet flip-flops from inactive to active in the space of twenty pages, and BEFORE THE LIVING END is propelled by her determination to find out who set her up and murdered her fellow agent. Velvet is not the young buxom blonde one might associate with a super-spy heroine. For one thing, she’s older than that stereotype suggests – closer to her forties than her twenties – and she’s not infallible. Despite the theatrics – and there are many – Velvet is a normal-bodied agent, out of touch, and slower than she once was. As the story flits from present to past, the changes in her body and mind are demonstrated through Epting’s art. Velvet remains beautiful throughout, but the slight changes highlights the attention to detail this creative team has taken with this project. VELVET is a fantastic new series from Image Comics, and merely the foundation of something brilliant from Brubaker and Epting. This volume’s finale has me waiting with baited breath for the next; in the interim, I guarantee I’ll enjoy more than a few re-reads of BEFORE THE LIVING END.